James Ferguson ’53, right, a retired colonel in the U.S. Army Chemical Corps, was honored as a Distinguished Member of the Corps at a ceremony in June. Ferguson’s contributions to the Corps include the development of protective masks, a chemical agent alarm system, decontamination systems, and new technologies for use in destroying chemical agents and non-stockpile material. His most far-reaching contribution to the Chemical Corps and to the protection of U.S. troops was his work on the development program of the portable Joint Service Mask Leakage Tester. 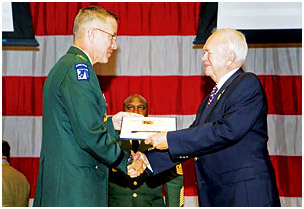 An ROTC student at Rensselaer who studied biology and chemistry, Ferguson was commissioned as a Reserve Officer in the U.S. Army Chemical Corps in 1953. His 31-year career in the Army Reserve included 21 years in troop program units and in chemical units. Ferguson chaired the American Defense Preparedness Association’s Chemical Operations Division from 1979 to 1992. His awards and decorations include Legion of Merit, Meritorious Service Medal with two oak leaf clusters, and Silver Medal Award. Ferguson is the president of Technology Marketing; he has operated a consulting firm for 27 years. An active alumnus, he served as chair of the Baltimore alumni chapter in 1988-89, and was awarded the RAA Alumni Key in 1997. 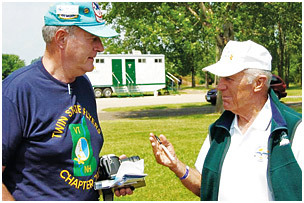 Joel Godston ’55, left, speaks with Chuck Yeager, the legendary test pilot who first broke the sound barrier in 1947. Both are active with the Experimental Aircraft Association’s Young Eagles program, which gives young people, ages 8-17, an opportunity to fly in a general aviation airplane. Yeager is chairman emeritus of the organization. Godston flies his 1976 Cessna 182 regularly and is active in many aviation groups.